https://sep.yimg.com/ay/yhst-33477391359232/frogspawn-assorted-branching-euphyllia-divisa-honey-coral-wall-frogspawn-coral-grape-coral-octopus-coral-9.jpgFrogspawn Assorted Branching - Euphyllia divisa - Honey Coral Wall - Frogspawn Coral - Grape Coral - Octopus CoralModerateAggressiveYesCalcium, Strontium, Trace elementsIndo-PacifcCaryophylliidaeSmall 2" - 3"
Frogspawn Assorted Branching is an interesting addition for the marine aquariums of experienced aquarists. The article briefs you upon the various aspects of Frogspawn Assorted Branching. Taxonomy: Frogspawn Assorted Branching belongs to the Kingdom Animalia, Phylum Cnidaria, Family Euphyllidae, Genus Euphyllia and Species divisa. Scientific names: Frogspawn Assorted Branching is scientifically called as Euphyllia divisa. Other common names: The other common names of Frogspawn Assorted Branching are Zigzag Coral, Wall Coral, Octopus Coral, Grape Coral, Honey Coral Wall and Torch Coral. Coral Type: Frogspawn Assorted Branching is a Large Polyp Stony (LPS) Coral. Origin or natural range: Euphyllia divisa originates from the Indo-Pacific region, Western Pacific Ocean and Australia. Color: Frogspawn Assorted Branching occurs in green, brown, tan and cream colors. Compatibility: Euphyllia divisa is aggressive towards the other marine aquarium invertebrates. Frogspawn Assorted Branching occurs in colonies that stretch over a meter. Euphyllia divisa is found anchored to vertical surfaces in shallow waters. At night, Frogspawn Assorted Branching extends its sweeper tentacles to six inches from its base. Frogspawn Assorted Branching is a big wall like structure. Euphyllia divisa has large sweeper tentacles with polyps dividing into small branches. Both the sweeper tentacles and branches are tubular in structure with the branches having knob-shaped termination at their tips. The knob-like tips of the branches resemble the appearance of a cluster of frog�s eggs and therefore the common name Frogspawn. The tentacles are generally brown in color with a dull shade tip and are visible during both, day and night. Frogspawn Assorted Branching has no columellae. Temperature of water: Seventy-four to eighty-three degrees Fahrenheit or twenty-three to twenty-eight degrees Celsius. Water flow in the aquarium: Frogspawn Assorted Branching needs low to moderate water flow in the aquarium it inhabits. Frogspawn Assorted Branching requires moderate lighting. 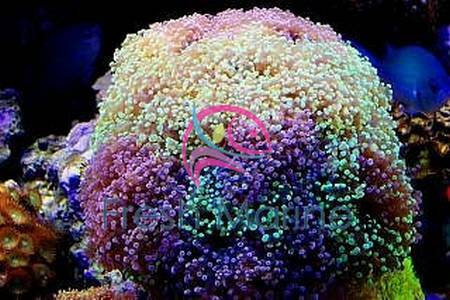 In case you have Metal Halide lighting in your marine aquarium then place Euphyllia divisa at the bottom of your tank. Indirect fluorescent lighting, VHO and power compact are recommended. Habit & habitat: Place Frogspawn Assorted Branching at the bottom of your marine aquarium. Keep Euphyllia divisa much away from the other members of your reef aquarium as it may sting them. Feeding & Nutrition: Frogspawn Assorted Branching derives its nutrition chiefly via photosynthesis which is performed by zooxanthellae, a photosynthetic alga living symbiotically within Frogspawn Assorted Branching. Euphyllia divisa may filter-feed a few times per week, when open. Frogspawn Assorted Branching eats acellular marine invertebrates, meaty bits of raw shrimp, Silver Side and Mysis Shrimp, brine shrimp, phytoplankton and zooplankton. Add calcium, Strontium and Trace Elements as dietary supplements for Euphyllia divisa. Frogspawn Assorted Branching grows rapidly if it gets the desired amount of Calcium as supplement. Frogspawn Assorted Branching requires moderate care. Euphyllia divisa is prone to infections due to the wear and tear during shipment. Do not keep Frogspawn Assorted Branching and hair algae in the same marine aquarium. Caution: Keep the other members of your marine aquarium at a considerable distance from Frogspawn Assorted Branching as the later may sting its tank mates if they happen to touch Euphyllia divisa.